Have a question on ATS? ATS is available in 9 different colors - Black Raven, Red Obsession Tintcoat, Crystal White Tricoat, Phantom Gray Metallic, Dark Adriatic Blue Metallic, Radiant Silver Matllic, Satin Steel Grey Metallic, Stellar Black Metallic and Silver Moonlight Metallic. Watch latest video reviews of Cadillac ATS to know about its interiors, exteriors, performance, mileage and more. Enriched with an aura of luxury and refinement, the Cadillac is among the oldest all-American automobile brand established in the year 1902. With the introduction of its first automobiles, Runabout and Tonneau, the brand amazed the world with its prestigious models which eventually paved its way to the Royal Automobile Club of England. And now with the unveil of the “Cadillac ATS”, the brand is ready for another surprise. Based on Alpha platform, the ATS was built with the in house treatment given to the model at its Michigan plant. Debuted at the United States in January 2012, the model stared its production tour in July 2012. 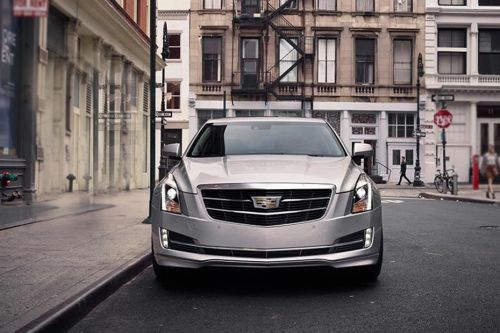 Crowned with numerous titles, the new ATS is bestowed with flawless beauty and performance rated powerhouse. Authentic material managed to the interior, would evoke your senses and make you feel packed with luxury all around. French-stitched leather surfaces unified with exotic woods and aluminum trims makes you realize the craftsmanship behind the wheels. Centred on an 8-inch touchscreen, the Bose premium surround system of the car immerses the cabin in its pure auditory with its 10- high efficient speakers. Cutting edge technology introduced to its centre fascia has some nice tech features that offers a decent human machine interface. The Cadillac User Experience (CUE) comes with multi-touch gestures and efficient navigation system. Multi-functional steering wheel and finely crafted gear lever offer the driver with a comfortable driving experience. Capacious interior of the car holds a decent boots space of 290-litres. Pushing the boundaries of iconic design and state-of-the-art engineering, the new ATS is the true example of innovation. Rigid, chiseled sheet metal architecture of the ATS allows it to swift brilliantly with little air resistance. Grey metallic paint accented on the radiator grille with prestigious brand's insignia, makes you realize the grandiosity of the marque. Razor sharp design of the bright white signature front lamps offers a distinct look to the classic body style. Subtle LED assents on the door handles and the repeater lamps integrated to the ORVM's offer equal elegance to the car. Measurement of 4643mm X 1805mm X 1421mm (L X W X H) and the rare design of the tail lamps imparts an aggressive persona to this sedan. Machine finished aluminum wheels of the car holds a wide 18-inch alloy size, that gives it a sports car credential. Bestowed with elegance, this plush wagon comes in five sumptuous trim levels- Luxury, Seating, Performance, Premium and Driver Assistance. Integrating high performance to its upscale models, the brand has housed a 2.5-litre and a 3.6-litre V6 under its majestic hood. Tested at the Germany's famed Nurburgring, the ATS remits a maximum power ranging from 202 hp to 321 hp (between 6300 rpm to 6800 rpm) and the rear wheel drive arrangement of the car is boosted with a peak torque range of 258 Nm to 372 Nm (between 4800 rpm to 6800 rpm). Mated with a 6-speed automatic transmission, the ATS guns to a speed of 100 kmph in just 5.7 seconds and at the same time putting gas on to full extent the car hits to a top speed of 262 kmph. Variable Valve Timing (VVT) technology equipped to the engine enables the ATS to deliver a city mileage of 8.1 kmpl and while on highways it goes for 12.8 kmpl. Brembo brakes of the ATS with 4 wheel disc comes affixed with anti-lock braking system that prevents the wheel locking condition during sudden braking incidents. Performance rated suspension of the ATS offers a decent ride to the occupants and ensures maximum stability during critical turns. Traction control system manages the engine torque and braking performance, thus limiting slippage during unstable vehicle conditions. Lane departure warning and side blind zone alert, alerts the driver by auditory or optical signals if there is any vehicle propelling in the blind spot area. Automatic collision preparation and air bag package ensures maximum safety during frontal collisions. With supreme elegance and high class cabin trim, the Cadillac stays at the apex positions in its segment. Apart from these, the comfort factors it holds would make it to attain an extra star compared to the rivals of its price level. What is the price of Cadillac ATS? On road prices of Cadillac ATS in starts from AED151,000 for base variant Standard, while the top spec variant Premium Performance costs at AED207,000 . What are the colors options available in Cadillac ATS?